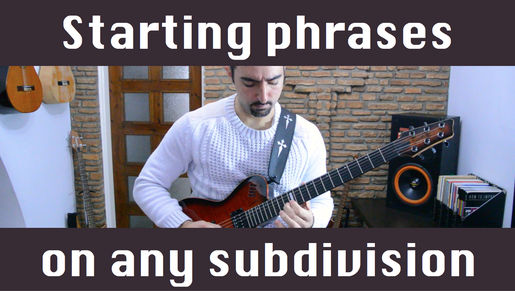 Learn how starting your phrases on different metric points can have a huge impact on the rhythmic variety and the quality of your solos. This can make your solos dull and boring, even if the content is otherwise good. You will be surprised at how quickly your phrasing will be enriched by adding the ability to begin on a variety of metric points. Then I mix up different points so you can see how much more free everything sounds when you have variety, compared to the first 2 examples. Again, I do not use any tricks and embellishments like bends slides and so on. I just play pure melodies with the Linear Freedom randomization concept so that you can give all your attention to the rhythmic aspect. After you watch the demo, I encourage you to put on a backing track and try a few different options. If you find the subdivisions hard to handle, then start with just the 4 different downbeats. Remember that as with everything we do here, the goal is to practice this enough so that you don't need to think about it anymore, and then let yourself relax and see your playing flow out effortlessly and fluidly. Feel free to drop me an email if you have any questions, or to let me know if you would like to see more lessons on this subject. Have fun with this, and I will see you in the next lesson.